Mitch Brown is in his twelfth year of teaching at Manor School in Fairfax. He has been an elementary school teacher for thirteen years, and is the proud father of a son and daughter. Prior to elementary teaching, Mitch was a collegiate coach and teacher, two-time NCAA All American runner, and a graduate student of kinesiology (emphasis in teaching and coaching), where he completed all of his MA coursework (ABT). He is a two-time inductee into Humboldt State's Athletic Hall of Fame, and was an Assistant Coach for the Drake High Mt. Bike Team in 2013. He has been a lifelong road, mountain and BMX rider, and currently rides with Divine Electric, racing whenever he can. Mitch loves teaching kids and having fun playing Capture the Flag, Kingo, and other games. His earliest biking memory is of riding his yellow Schwinn Stingray up and down his street while singing the Happy Days theme song for hours on end. He is looking forward to his seventh year leading mountain bike camp. He is the official camp nick name-giver, and is Wilderness First Aid & CPR Certified. Eileen is stepping out from behind the computer to co-lead our girls' group during week #2. As a mother to two, a licensed psychotherapist and creator and leader of Artemis Circle, Eileen brings a special touch to our girls' programs. She is an avid trail runner who rode her bike with an all-women's group across the U.S. 20 years ago to raise money for AIDS education. She is excited to learn and grow as a mountain biker this summer. Eileen is Wilderness First Aid certified. We are stoked to have Jason "J.J." Jones, a music teacher at Marin Primary & Middle School and a fixture on the local music scene, join us at camp again this year. J.J. served as Director of the Marin Primary Summer Day Camp for over 10 years, and started their mountain bike elective class/club for middle-schoolers. He is the proud father to two lucky girls, & can be seen on weekends riding through town on his road or mountain bike. His other skills include freestyle rapping, and infecting others with his joie de vivre. He says his earliest biking memory is, "being six years old and taking the training wheels off all by myself, no one around...took my Dad's wrench, liberated the attachments from my bike and coasted down the driveway! I felt like Leonardo DiCaprio on the bow of the Titanic!" J.J. is First Aid/CPR Certified. We are excited to have Matt Penwell, an educator and administrator at Marin Primary and Middle School, join us again this year! A native of Fairfax, Matt grew up riding the local trails with the likes of Myles Rockwell (Mt. Bike World Champion). Since turning to cycling to rehab a knee injury sustained on the Drake High soccer team, Matt’s passion for biking has continued to grow. 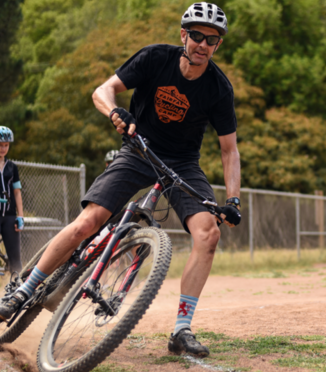 He now shares his joy for mountain biking with his students at Marin Primary and Middle School where he acts as a ride leader for a mountain bike elective class. In addition to Marin Primary and Middle School, where he has worked for nearly twenty years, Matt has also led various camps, such as Marin Surf Camp in Stinson beach. When not riding his bike, Matt can be found playing music at various night clubs throughout the Bay Area with his wife, Amie Penwell. Matt is First Aid/CPR certified. Welcome, Matt!! Satchel Cronk is a senior at UC Santa Barbara, where he studies political science and history and is an active member of the mountain bike team. He is a Drake MTB alum, and since becoming an avid mountain biker in high school, has traveled extensively in pursuit of the next piece of sweet singletrack. Satchel is almost never caught without his camera, and loves documenting his adventures as he enjoys the trail. He is wilderness first aid for mountain biking certified, and has worked as a counselor at a variety of camps. His brother, Griffin, is joining us again this year as a counselor. He has always enjoyed being around kids. Satchel shot the video and many of the photos on our site. Jason Heffernan is a life-long Fairfax local and a talented cyclist who brings his kind manner and playful riding style to camp again this year. He is proud to be raising his four boys in Fairfax, where he is a bike mechanic and crucial part of Fairfax Cyclery's staff. Jason taught preschool at the Fairfax-San Anselmo Children's Center and still has former students stop by the shop to say 'hi.' Jason first hit the trails out of Deer Park on his BMX bike with bald tires, which caused him to learn solid handling skills very quickly! We're looking forward to hitting the trails again with you! We take care when selecting our counselors as they are a crucial link in a mentorship chain of relationships - we mentor them, and they help mentor the campers. This year we are excited to roll out our newMentorship Training Program, which offers our counselors more extensive and supportive training and opportunities for growth. Esmée just finished her junior year at San Domenico, and her third year racing and riding mountain bikes. Esmée started riding her freshman year and fell in love with biking instantly. She is a leader of the Body Positive program at San Domenico and is starting a project with the NorCal league to educate coaches in the Body Positive training. She worked with Street Level Cycle, a bike shop for people who need cheap bikes for transportation or a place to fix up their bikes. She learned bike mechanics, fixed up old bikes, and helped others fix their bikes. Esmée is excited to share her love for biking and can't wait to meet all the kids! Luna is finishing up her first year at CU Boulder. She raced for San Domenico for 4 years in high school and is now exploring trails in Boulder, as well as rock climbing and running. This will be her 4th year counseling. She is First Aid/CPR certified. "I am so pumped to get to know our new riders and having a great summer of riding and laughter!" Hayden is finishing his junior year at Drake High School, where he is a JV racer on the MTB team. He is also a former student of Mitch's. We are excited to have him join us again this year as a counselor. Hayden's passion is downhill mountain biking and every opportunity he has he can be found riding the trails of Northstar. He is First Aid/CPR certified. Griffin is joining us for his third year as a counselor. Griffin is a senior at Drake and races on the mountain bike team. His is a friendly, kind presence, and he has a great way with children. A sophomore at Drake High, where he races on the mountain bike team, we are excited to work again this summer with Liam. He was a student in Mr. Brown's class, and started as a camper before becoming one of our steadiest counselors. Check out this Sports Illustrated article on Drake High's team, in which Liam is quoted!! He has extensive medical and emergency training, as he is a Marin Search and Rescue member, a Certified Emergency Medical Responder, and First Aid/CPR certified. Luke is a junior at Marin Academy, where he races on the mountain bike team. His sister was a student in Mr. Brown's class, and he has become an integral part of our counseling team. As a Marin Search and Rescue member, a Certified Emergency Medical Responder, Luke has extensive medical and emergency training. He is also First Aid/CPR Certified. Luna is finishing her sophomore year at San Domenico High school. This spring season was her second year racing/ riding. She started mountain biking because her friend was a part of the team but totally fell in love with the sport after her first ride. She loves getting outside, exploring new trails, being in nature and being part of the MTB community. Luna is a seasoned baby sitter who cannot wait to share her love of mountain biking with other kids while they find their passion in riding. Marcos is a sophomore and races on the Drake High School mountain bike team. He is returning for his second year as a counselor. A Fairfax local, he began his mountain biking career as a camper at this camp and has been riding ever since. We are pleased to have Savilia return to Fairfax Cycling Camp this year! She is a sophomore at San Domenico, the first all-girl team in the state. She has been racing bikes since she was 12, and rides for Whole Athlete Grassroots Team. She was recently invited by USA Cycling to compete in their development camp in Boulder, CO. She has grown up riding most of the trails of West Marin, and her earliest biking memory is when her brother, Silas, taught her how to ride without training wheels and launched her down the driveway. We were wowed by Savilia's amazing bike handling skills last year, and are excited to have her show us all how it's done again this year!